Naivasha is a market town in Nakuru County, Kenya, lying 47 miles north west of Nairobi. The town has a total population of 181,966 (2009 census). Naivasha is also a popular tourist destination. Hell's Gate National Park (the main locations for Lion King, including Pride Rock and the Gorge, are modelled after the park), Longonot National Park and Mount Longonot are nearby attractions. Tours also have included Lake Naivasha, to observe birdlife and hippopotamus behaviour,  as well as other wild animals. In the late 1970s–1980s Lake Naivasha was overrun with poachers and foreign creatures introduced into the lake to provide fishing. The migratory paths along lake Naivasha were being destroyed by the local rose industry. The naturalist Joan Root (1936–2006), spent the last decade of her life trying to save the lake and its wildlife. 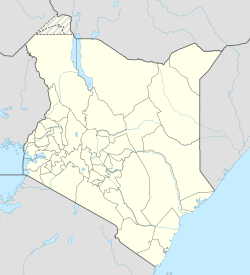 Naivasha is located on the shore of Lake Naivasha along the Nairobi–Nakuru highway (A104 road) and the Uganda Railway. In 2015, an extension of the new standard gauge railway to this town was approved. Lake Naivasha Country Club – historic site in the area. ^ a b "2009 Census Vol 1 Table 3 Rural and Urban Population | Open Data Portal". opendata.go.ke. Archived from the original on 29 July 2016. Retrieved 28 July 2016. ^ "Geographic coordinates of Naivasha, Kenya. Latitude, longitude, and elevation above sea level of Naivasha". dateandtime.info. Retrieved 28 July 2016. ^ "The Lion King (1994) - Trivia - IMDb". imdb.com. Retrieved 28 July 2016. ^ "Lake Naivasha Country Club" (wildlife, map, photos), Go2Africa, 2003, go2africa.com webpage: Nav. ^ "Kenya Std Gauge To Be Extended | Railways Africa". railwaysafrica.com. Retrieved 28 July 2016.